On your Mac, email works in much the same way as on any other computer. You can create an account with an online company, such as Google, Yahoo!, Microsoft’s Hotmail,) or with your Internet Service Provider. Then, you can send and receive messages either through a special email program, or via a webpage. In fact, most ISPs provide at least one email address as part of any Internet access package. These accounts are reliable, free, and they don’t send you ads along with your messages. One disadvantage, however, is that if you ever switch your ISP, you’ll lose the email address. Using a webmail provider has its advantages, one being that your account doesn’t tie you to your ISP. Furthermore, Google and Yahoo! provide ample online storage for your messages. You can leave all your emails permanently online and access them from anywhere. You can also download messages to an email program on your Mac. You can’t customize the second part of your email address as you are stuck with the email provider’s name after the @ sign. The only way to by-pass this is to register your own domain name and web address. In this case, you’ll gain control of all addresses ending in that domain. Addresses ending with your domain name, such as admin@igotoffer.com or cs@igotoffer.com (cs is short for Customer Service), attract plenty of kudos and are practical, as they don’t lock you to any individual ISP or email provider. The downside is its cost, as you’ll have to pay an annual fee to control the domain you have registered. 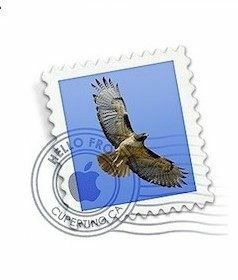 There are many mail applications available on the market, but Apple’s Mail is best-suited for the majority of Mac users. This application is stable, user-friendly, and equipped with some very cool features. It offers unmatched integration with Address Book and the Calendar application. All email programs are very similar, so you shouldn’t struggle with Apple’s Mail if you’re used to other Mail systems. There are other options, such as Microsoft’s Entourage, which is essentially the Mac version of Outlook. There is also Thunderbird, a powerful, completely free open-source mail application with unique tools, such as a built-in RSS reader, and Opera Mail, which is built into the Opera browser. Apple’s Mail application should be visible on your Dock when you purchase a Mac, but if not, you’ll find it in Applications. Description: You can add whatever you like. Type: In most cases this will be POP3, though if you are using another account, specify the details. Incoming mail server: The name of the computer where your messages are stored until you download them. Outgoing mail server: The name of the computer that routes your sent mail in the right direction. Those are the only essential settings, but before closing the Preferences panel, have a look through the Mailbox Behaviors and Advanced panes, where you’ll find extra options to temporarily disable accounts, set junk mail to be deleted, and choose whether you’d like to leave copies of the messages on the server after downloading them. Now you’re ready to start sending and receiving emails. POP stands for Post Office Protocol. POP or POP3 email accounts can be sent and received via an email program such as Mail or Entourage. Each time you check your mail, new messages are downloaded from your provider’s mail server onto your Mac. When using a computer messages are usually deleted from the server as you download them. You can leave copies on the server so that you can download them from other computers. IMAP stands for Internet Message Access Protocol. An IMAP account can also be sent and received via an email program. All the messages are based on your mail providers server, not on your Mac. When you open your mail program, it downloads the email headers, such as from, to subject, etc. Clicking on a message will download the full text of the message but not delete it from the server. Exchange is Microsoft’s corporate system. If you use Outlook at work, it’s likely that you’re using an Exchange email account. You can set up an exchange account on your Mac at home using Apple Mail, if the administrator at your office allows it. Web Access: Most POP, IMAP and Exchange email providers also let you send and receive email via a website. To create a new message, click New, or the Command key + N, and enter one or more addresses in the To: and Cc: fields. You can either type these manually, or add contacts from Address Book. Click the Address button, select a contact, and either click the To or Cc button, or drag the contact into your message. Then, add a subject, type your message, and, if you want to change how the message will look, click the Fonts and Color buttons. You may also want to add an attachment and a signature. After everything is done, click Send or Save as Draft if you’d like to come back and check what you have written. The other way to create a message is to respond to one that has been sent to you. You have various options, all of them accessible via the Message menu, and in the menu that appears when you right-click a message. To reply to a message – Command key + R. Responds to the sender alone. To reply to all – Command key + Shift + R. Responds to all the recipients of the email. To forward a message – Command key + Shift + F. This combination sends the message on to someone else. Note that you can forward more than one message at once by simply highlighting various emails by clicking on them one by one while holding down the Command key. When you click Forward, the text and attachments will be combined in a single email. To redirect a message – Command key + Shift + E. This combination forwards the message in such a way that it will appear to have come from the original sender, at the original date and time. Sometimes this feature can be useful. Reply with Messages – Command key + Shift + I. You can use this option to start a text, voice, or video conversation if a person uses Messages. Bounce – Command key + Shift + B. The original email will be returned to the sender, to whom it will appear as if the message never came through. This feature is useful for replying to unwelcome correspondents, and for creating an excuse when you forgot to reply. When you reply to or forward a message, the original text is quoted at the bottom of your email, colored and styled to differentiate it from your reply. To change how quoted text looks, or to change how this feature works, go to the Fonts & Colors and Composing panels of Mail preferences. The View menu and button let you add two fields when creating messages. BCC: Lets you copy in recipients without the other recipients being able to see. Useful for sending group email when you don’t want all the addresses to be public. Reply-To: Add an address here and any replies will go to that email account, rather than the one you’re sending from. To include a document, photo, or any other file along with your email, click the Attach button or the Command key + Shift + A. Next, choose the file you’d like to send. You can also drag and drop the files into the message window. Note, however, that big attachments can take a long time to download on a slow connection, so you shouldn’t send attachments larger than a few megabytes. Alternatively, you can compress files before attaching them, or share them via iCloud. You can always add a personal touch at the end of your emails in the form of signatures. A signature may contain your phone number, address, job tile, or even a recycled witticism. In Apple’s Mail, to create or edit signatures, go to Preferences from the Mail menu, and look in the Signatures panel. You can create as many signatures as you’d like, and choose which to use on a case-by-case basis with the Signature menu (underneath the subject in blank messages). If you want, you can change the text style via the Format menu, or even drag in a file such as your vCard from Address Book, which the recipient could then import into their own contacts list. If you want a message to make an impact, you can click the Stationary button to select from various Apple-created HTML templates, with graphics for birthdays, announcements, and more. When you are connected to the Internet, Mail will dispatch messages as you send them. Otherwise, the messages will sit in the Outbox until you connect. Likewise, Mail will check for new emails at regular intervals, when your computer is online. You can specify the frequency under the General panel of Mail Preferences. You can also check for messages at any time using the Get Mail button. When new messages arrive to your mail box, you’ll hear a sound. If the default tone annoys you, you can change the new mail sound under the General panel of Mail Preferences. The Mail’s icon in the Dock displays the number of unread messages, marking them with a little red star. Within Mail, each mailbox also displays a number, referring to the number of unread messages the particular mailbox contains. Individual unread messages are marked with a blue dot, but you can change their appearance For example, you can have them displayed in bold type. To do this, look within the Viewing panel of Preferences in the Mail menu. As a rule, incoming mail arrives in your inbox, which can be broken down into sub-inboxes. To keep mail organized, you may want to sort messages into folders. In Apple Mail, to create a mailbox, press the “+” button at the bottom-left or use the Mailbox menu. Drag the messages you want to a newly created mailbox. If you want a message to appear in more than one mailbox, hold down the Option key while dragging the message into a new folder (special mailbox). To sort your messages, you can click the text at the top of the relevant column (From, Date Received, Subject, and so on). To add more columns, right-click any column header and choose from the list. To set up “rules” and see when an event takes place in your email, open Preferences from the Mail menu, then look under Rules. Click Apply Rule in the message window, or click the Command key + Shift + L to apply a rule. This can be useful, as Mail will tell you when a certain message arrives from a specific sender or to a specific recipient. The rules can be run at any time on existing messages. To organize by thread, use the Organize by Thread command in the View menu. This lets you view all your emails as nested “conversations”. The initial message in the conversation will be located at the top, and all the replies to that message will be found underneath. It is possible to expand or collapse each thread by using the little triangles to their left. You can also deal with them all at once by using the options in the View menu. If you want to keep track of the RSS feeds you have subscribed to, you can view all the feeds in Mail. In this case, you’ll spot new articles or posts every time you check your email. You can search stories, mark them, sort, and delete them, just as you would with messages. To add an RSS feed to Mail, use the “+” button or click File – Add RSS Feeds. Next, either choose from feeds already bookmarked in Safari, or paste the URL of one or more feeds into the Custom box. To find the URL of a feed, visit the Website in question and look for the RSS, Feed or XML link. A To Do list a useful way to stay on top of upcoming tasks. Click the To Do button (alternatively use the Option key + Y) to add a new entry to the list. You can also right-click, or Ctrl-click, the entry and assign various attributes to it, such as priority rating, reminder alert, deadline, and associated Calendar application. To make attributes visible or invisible in the list, right-click the header of any column. Everyone receives a certain amount of spam, which is an unsolicited message which offers anything from links to “adult” sites, to get-rich-quick schemes. Needless to say, such messages are usually scams of some sort, so never reply to them. Never follow links from these messages to websites to take up their “offers”. To reduce your share of spam, you should avoid making your email address too public. You can consider using a second account or an alias for anything such as signing up to mailing lists, publishing online, or giving out to customers or clients. In this case, if the new address gets too bogged down, you can stop using it and set up another address. If you’re already receiving a lot of spam, you can “train” your email application to filter out the junk as it arrives. In Apple’s Mail, suspected spam messages are automatically marked in brown. If you see a legitimate message that is marked as spam, select it and click Not Junk. Likewise, if a spam message has been missed by your mail, select it and press Junk. If you use a Mac at home and a PC at work, you can easily set up your mail account on both computers. With the default settings in place, you’ll usually find that if you download messages to one machine, they’ll be deleted from the server and will no longer be available to download to the other. One workaround is to set up Mail to leave a copy of the messages on the server after downloading. To do so, uncheck the Remove copy from server… box on one computer. You’ll find this within Mail – Preferences – Accounts – (the account) – Advanced. On the computer, choose to delete the server copy after a couple of weeks. That way, as long as you’re using both machines, you’ll always have a complete and up-to-date mail archive on both computers. You can also choose an IMAP email account, use the syncing features, or grab a Google Mail or Yahoo! account that provides enough server space to leave a copy of all messages online. Why not sell online Apple devices you don’t need anymore. Check out our prices. We pay the best price online for your used electronics, just drop by our main page. Free instant quote, free fully insured shipping, fast and secure payment. Save money with us for your new model!